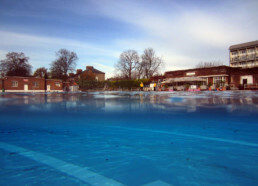 Nestled in the corner of Brockwell Park, the lido is a 50m pool flanked by sun bathing terraces and fully enclosed by a boundary wall and long, low, flat-roofed pavilion buildings in a moderne style. These have been sensitively restored and extended to provide new health and fitness facilities alongside the pool. 50m x 27m pool (open all year), gym, exercise studio, health suite, hydrotherapy pool, indoor cycling studio and car park. 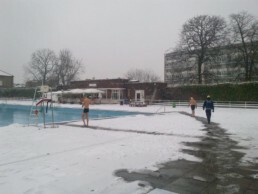 The Lido Café is open to non swimmers as well as serving lido users. 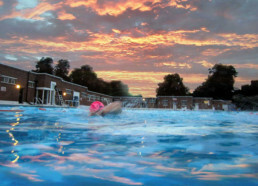 Brockwell, along with Parliament Hill Lido, hosted the London County Council Swimming Championships every year for 22 years, from 1947 to 1968. The lido was closed from 1990 to 1994 and during this time it was squatted for various events including a whole summer of cultural activities and events in 1993 which included Exploding Cinema’s ‘Dive in Show’ which had an audience of over 2,000. Fusion designed and project managed a major restoration and redevelopment of the lido in 2006/2007. 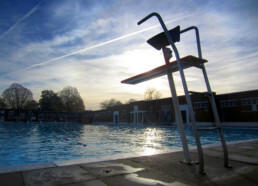 They manage the pool on a full repairing lease granted by Lambeth Council and work in conjunction with Brockwell Lido Steering Group to offer a wide range of activities and facilities for the local community and visitors to Brixton.